During WWII, dozens of the bloody campaigns raged around the globe, involving millions of US military personnel. Four hundred sixty-four of those Americans received the Medal of Honor — two hundred sixty-six of them posthumously. Most of the recipients received the medal for incredible feats of valor while attacking the enemy. However, in a few instances, the medal was given to a recipient that never attempted to harm the enemy. Desmond Doss, a conscientious objector from Virginia, was one of those recipients. 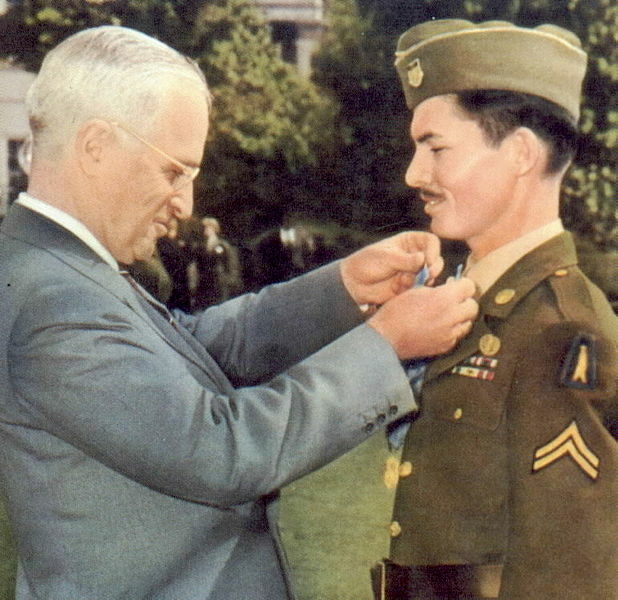 Seventy years ago, on October 12, 1945, President Truman awarded Desmond Doss the Medal of Honor for his conduct during the US campaign to take Okinawa from the Japanese imperial forces. The US undertook the invasion of Okinawa to establish large air bases for operations during the anticipated invasion of Japan. On April 1, 1945, 250,000 combat troops, organized into three US Marines Divisions and four US Army Divisions, stormed the shores of Okinawa. The landings, themselves, were conducted without much resistance from the approximately 90,000 Japanese defenders. By 1945, the Japanese had decided that it was unwise to expose their forces to vastly superior US naval gunfire and US air support on the narrow beach zones where the concentrated fire would devastate them. Instead, they built strong defensive positions inland from the beaches, where the US advantages in naval gunfire and air support were negated by the close proximity of the attacking US troops. To defend Okinawa, the Japanese military had perfected two other major defensive innovations. The first of these was Kamikaze (Divine Wind) suicide air units. Most of us are familiar with the Kamikaze fighter plane units that were unleashed with devastating effect against the US Navy’s amphibious fleet during the US invasion of the Philippines in October of 1944. By the time the US invaded Okinawa, the Japanese had further refined their aerial Kamikaze weapons. In particular, they had developed a man-guided rocket-propelled bomb. These fast moving rocket bombs were difficult to shoot down, and, in combination with the slower Kamikaze fighter craft and light bombers, they managed to kill nearly 5,000 US sailors while sinking twenty amphibious assault ships and twelve destroyers. On land, the Japanese introduced their second highly effective and savage innovation – the child suicide bomber. The occupying Japanese conscripted middle school children to conduct suicide bomb attacks against the invading US troops. US Marines and soldiers were hesitant to shoot at civilians that ran toward their lines because some of them were simply trying to escape the Japanese. Unfortunately, many of the children carried explosives under their loose fitting shirts. In some instances, the Japanese troops sent forward young mothers with babies. When US troops left their cover to try to assist the women and babies, Japanese snipers killed the US rescuers. This combination of the aerial Kamikaze and the child suicide bombers greatly complicated the battle for the US forces. The Japanese commanders in Tokyo, pleased with the effectiveness of the suicide bombers, ordered the conscription of all boys aged fifteen and older and all girls aged seventeen and older to be trained and equipped as suicide troops for the defense of the home islands against the awaited US invasion. Such was the savage nature of the fighting on Okinawa, which made Desmond Doss’s conduct all the more remarkable. Because of his religious beliefs, Doss was a conscientious objector. He did not want to engage in combat. His beliefs, however, did not keep him from serving in the US Army as a combat medic. After his discharge from the US Army, Desmond Doss spent five years in treatment for his injuries and for tuberculosis. He died in March, 2006. Of the thousands of stories of outstanding courage during WWII, Desmond Doss’s story is one of the most remarkable. He did not act with a burst of adrenaline for a few minutes to achieve remarkable results, but rather he acted calmly and repeatedly risked his life under fire for several days in order to save his wounded comrades. In the midst of one of the most savage battles of history, Desmond Doss, conscientious objector and Medal of Honor recipient, still stands as an outstanding example of courage and compassion. Pfc. Doss’s story is being brought to the big screen on November 4, 2016, in the movie HACKSAW RIDGE. Watch for the Bayard & Holmes review. Compare this man with a contemporary of mine who was a conscientious objector – Cassius Clay – or Mohammed Ali, as he called himself. Although his objections didn’t preclude his fighting for a living, he refused to serve the military in ANY capacity. Those of us who were in the service at the time considered conscientious objectors to be nothing more than cowards. Glad to hear about one who was more.